Victorian Gardens Amusement Park has been opened since 2003. 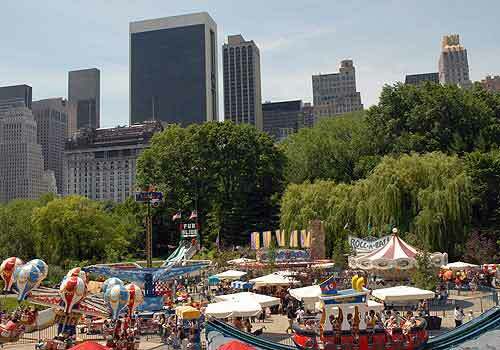 As the summer operation of Wollman Rink, this whimsical family amusement park features twelve hand-crafted rides that are sure to delight all guests. Various games assure that all victors go home with a prize. Live interactive shows keep both kids and parents laughing, hula-hooping, dancing and singing. Classic concessions such as cotton candy, caramel corn, and ice cream are munchies that keep the entire family fulfilled. Finally, shaded sitting areas keep guests cool even on the hottest of New York City summer days! Victorian Gardens is the perfect venue to celebrate a child's birthday party or to have a group outing. The price structure allows guests to either purchase an unlimited ride package good for the entire day or visit on a pay-per-attraction basis. No need to travel miles away from Manhattan to enjoy the fun and thrills of a family amusement park! Victorian Gardens is a great excuse to spend the day in the heart of New York City and a special way for families and friends to share life-lasting memories together. East Side between 62nd and 63rd Streets.